Whenever I do my grocery at Rustan's Supermarket, I always drop by Keos' booth at Shangri-la Mall. 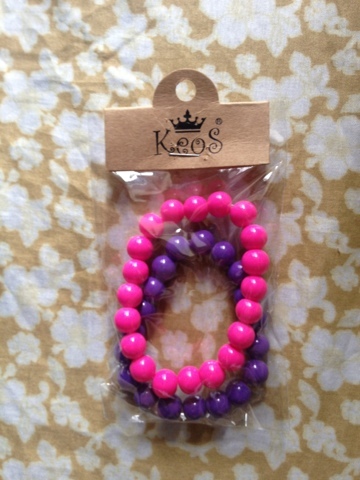 Like I said before, Keos is a store that sells affordable accessories. And I often find myself enticed with their garterized bracelets and rings. As much as I love to wear bangles, only few of them suit my thin arms so I don't normally buy the regular and very trendy ones. I just stick to those that are garterized or that can be adjusted when worn. 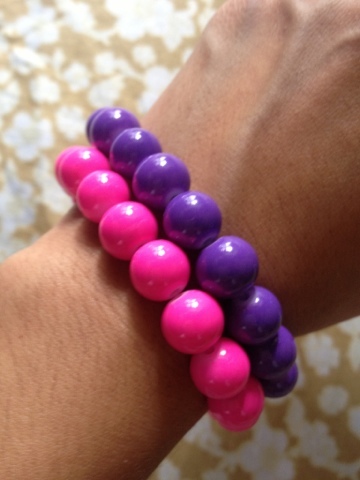 And luckily, I found new additions to my growing collection of garterized bead bracelets from their store! These two pretty things only cost Php50.00 each. Not bad right? If only I could have them in all possible colors haha! Are there any store, which sells bracelets for my size that you can recommend? I'm really interested to know so ladies like me will have more options when looking for this type of accessory. If ever the stores that you will mention are not hard to visit, I'll do a post listing them once I checked their shops, and I'll include your names to acknowledge you for your suggestions. Have a great day! hello sis! really? that's nice :) I'm interested to know their shop too. thanks in advance!